"Man Ain't Nothing but a Man"
Day 1: John Henry Irons suits up as Steel as he listens to Lex Luthor. Luthor has found Natasha Iron's bug and has captured Nat. He's goading Steel to come for him. 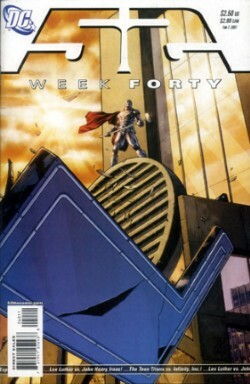 Steel notifies the Teen Titans to meet him at the Lexcorp Building. Nat tries to warn him that it's a trap. Steel and the Titans (Raven, Aquagirl, Beast Boy, and Offspring) crash the building. Lex's Infinity, Inc. and a bunch of robots try to stop them. As Lex watches the fight on his laptop and Mercy watches over a captive Nat, Beast Boy tells Steel to go on and leave the Titans to fight Lex's security. Remembering that the building's been evacuated, Steel flies straight up crashing floor by floor all the way to Lex's penthouse office. Steel knocks out Mercy. Nat runs up to him and hugs him - except it isn't Nat. It's Everyman who morphs into a giant lobster and wraps his claw around Steel's armor. Steel summons all his strength and blasts the lobster claw off just as his armor cracks off like, well, the shell of a lobster around a piece of lobster meat. Everyman's hand is hurt and probably broken - the pain forces him back into his own form. Steels asks where Nat is and Everyman tells him probably with Luthor, then Everyman falls through the hole Steel made flying up there all the way down to the Titans. Steel confronts Lex. He doesn't know Lex has super powers and he's blindsided by a blast of heat vision just as Nat tries to fill him in that Lex is now super. Steel charges on but Lex is slowly killing him. Is this what the heroes were referring to 'one year later' in "Justice League of America" when they talked about getting retribution for Steel? Lex prattles on about remaking the entire planet in his image, even renaming it Lexor. As Lex fights John Henry, Natasha uses the technology in Steel's hammer to turn off the artificial super gene in Lex Luthor. Now de-powered, Steel easily defeats Lex. Below the Titans are listening for what's happening above them. There's only silence and then they scream "Look! Up in the Sky!" and down slams the Lexcorp logo from the building. Steel stands triumphantly, with his arm around Natasha and his mechanical hand missing (which he jettisoned during the fight). Lex lies defeated at their feet. Day 5: Kahndaq continues to wither. Its gardens are dying. The country is overcome by disease and civil unrest. The entire country's been under a pounding (perhaps poisonous?) rain for more than a week. Osiris blames himself for what's happening to Kahndaq. As he explains to Sobek, he believes he's cursed all of Kahndaq by killing. He wants to make a pilgrimage and asks Sobek to come with him so he can relinquish his powers and gain new ones. He wants to go to the Rock of Eternity and "find a new family." Story - 5: What a day - day one, I mean, of course. This was a super story for Steel and a potent reminder of why Metropolis thought this guy might be Superman reincarnated when he first started wearing the Steel armor after Superman's death in 1992. No matter what happens to Steel for the duration of 52, this definitely feels like his arc's climax. My only real question is how did John Henry survive a full frontal blast of heat vision? I suppose Lex could have purposely been holding back or not hit him full strength though the art makes it look like a pretty strong blast of laser heat. Or has John Henry retained some of the power of the Everyman Project? Lots of questions (not Questions - no Vic and Renee this issue). Art - 4: That full-page image of Steel flying up through the floor, storey by storey, should be a poster. The other full-page image in the issue with Steel and Nat standing over a defeated Lex is just as powerful. Sometimes Batista's art can feel claustrophobic like it often did in the final story arc of "JLA". But this doesn't happen here, I think, because Giffen's doing the art breakdowns. I wonder if DC should pair pencillers with more senior artists doing breakdowns more often? Cover Art - 5: What a super man. It's a beautiful image that presents a view of something we see from a different perspective and vantage point inside the comic. Steel's pose is iconic; it makes me wish the artist had found a way to make Steel the foreground image. Nevertheless, putting Steel in the background has its symbolic context too, for a character who some may have seen mainly as a supporting player on 'Team Superman', so it's hard to find too much fault with the cover layout.